"The Paraliminals take me into meditation faster than anything else. I feel more powerful and motivated after listening, and they help me train my mind to think positively in a way that it sinks into my subconscious mind. They have helped me increase my resiliency and tenacity to stay the course when faced with challenging situations." "I first used the Prosperity Paraliminal. I was deeply in debt. I managed to pay off my debt. I now own my farm and have a better paying job that is much more rewarding." "If you are a life-long learner like me, I highly recommend Learning Strategies. I believe you will find them an excellent partner to help you improve your life." "I have used most of the Paraliminals at one time or another. They always help, and sometimes trigger remarkable changes in how I respond to challenges. Power Thinking helps me move forward from being stuck. Self Discipline helps me tackle big projects more effectively. I could go on…but it would take pages. I highly recommend the Paraliminals!" "Because of a medical condition, I have struggled with sleep for several years. Since purchasing the Sleep Deeply and Deep Relaxation Paraliminals, I nearly always drift off into a deep sleep right away. I also love the Memory Optimizer. I find it a wonderful aid to strengthening my memory." "I feel more open to new experiences and possibilities where none previously existed. I think much more clearly and am able to remain calm during stressful situations. My intuition and decision making abilities are sharper and I find that I am more easily able to connect with others." 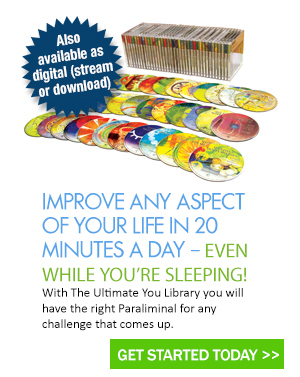 "The Paraliminals are one of the most easy and effective ways of learning! Just plug in your headphones and take your life to a new level. You can even learn while sleeping. I can’t recommend them highly enough!"